Thus opens the curtain on Lilian Nattel’s The River Midnight, a grand tale about the fictional Jewish shtetl (little town) of Blaszka at the end of the nineteenth century. It’s a year of ritual and miracle, of friendship and betrayal, of yearning and fulfillment. Also the lifetime of a Jewish community surviving the struggles of existence on the spiked tail of Russian-occupied Poland. At the heart of this story are four vilda hayas, the young wild girls with dreams of freedom, love, and the future. Hanna-Leah, Faygela, Zisa-Sara, and Misha run to the woods outside the village to dance, sing, collect wild mushrooms, and share secrets, untamable as teenagers everywhere. As they grow up they accept their places in the community, each with an outlook reflecting her position. Hanna-Leah, a talented cook who always does what is right, marries the butcher but is unable to bear children. She is envious of her best friend, Faygela, the would-be intellectual who has six children as the wife of the baker. Always kind-hearted Zisa-Sara follows her husband to New York where they both die in a terrible factory fire. Their orphaned children, daughter Emma and a son, return to Blaszka to be raised by the sensible Alta-Fruma. Misha, the most outspoken and independent of the four vilda hayas who flaunts disdain at all useless rules, divorces after a brief marriage. She lives alone near the river, becoming the village midwife and the person to whom everyone turns when they desire a potion for special needs of inciting romance, building strength, or overcoming illness. Blaszka is also populated by rabbis, water carriers, busybodies, prophets, gypsies, drunkards, mysterious strangers, the vulgar, and the refined. Some folk are noble, some are vulnerable, and some pious. Each contributes an essential, memorable element, no matter how small. You will recognize all of them. It’s soon discovered that Misha is pregnant by a man she refuses to identify. Gossip moves along the lifeline of the village as certainly as the meandering current of the adjacent river. Villagers speculate who might be the father but are met by her silence. Misha’s painful labor provides a tender scene at the end of the story. I haven’t spoiled it by telling you that much because what ensues is a bit of a miracle in itself, given that the birth falls on Yom Kippur, the holiest day of the Jewish year. At times the book reads like a fairy tale, rich with Jewish nuance and superstition. At other places it resonates with the history of Jewish Europe. In some passages it blares like a bawdy song one might hear in a saloon where the drunkards mingle with those who might be prostitutes, angels, or conmen. Its scenes of magical realism will remind readers of the works of Isaac Bashevis Singer, I. L. Peretz, or Sholem Aleichem who also wrote of the European Jewish communities lost to World War II. Always, Nattel’s sensitivity to universal relevance is captured within the intimacy of a place so small that only a few hundred souls live there. Nattel based her book on the stories her family told when they emigrated from Poland to Canada. She researched for years, reading dozens of relevant books, and included a glossary at the end to help the reader understand the Yiddish dispersed throughout. The glossary is essential for those unfamiliar with the mixing of two languages. I was also raised with Yiddish words and phrases sprinkled by my family as well as stories about shtetl life, and I still found it illuminating. The very last words of the book are once upon a time. How enchanting is that? 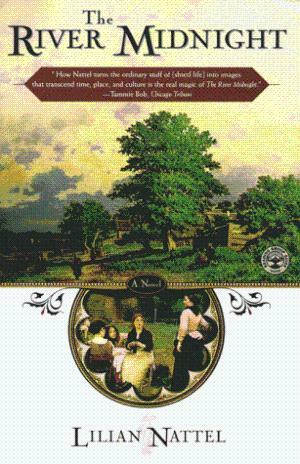 The River Midnight won the Martin and Beatrice Fisher Jewish Book Award in Fiction in 1999. I look forward to learning about your favorite R fiction books. *Just so you know, this passage is the very beginning and the very end of the prologue of the book. Shari, this sounds like a magical lyrical novel…sweeping and all-encompassing! The final words are just delightful and yes, enchanting and how daring to finish where many books start! You’ve read To Kill a Mockingbird six times! Wow! That is impressive…some books definitely deserve such an honour and need that time to unlock their secrets. As for my R books, you’ve listed a few of them already!! I immediately thought of Roots…then I’ve read Room and The Road as well. Going through my bookshelves came across The Remains of the Day by Kazuo Ishiguro – just wonderful, so understated whilst so deep. Yes, The River Midnight is exactly as you’ve imagined. I’ve read most of the books I’m choosing to highlight at least twice as well as many of the books listed at the bottom. Once I get taken by a book, I want to go there again. The Remains of the Day is on my TBR list, but the list is pages long – just titles! Thanks for the suggestion, Annika. I’d never heard of this, but it sounds wonderful – another one for the ever-growing reading list! My pick for “R” would be Ben Aaronovitch’s “Rivers of London”. A pretty unusual mix of magic, ghosts and police procedural, and very funny into the bargain. Thanks for the Aarnovitch suggestion – it does sound like a terrific read. I’m impressed by writers who can get humor into a book because it isn’t easy. What are you working on now? I miss your blog – you always made me think, and you made me laugh too. Has your book been translated into English? Thanks Shari. I keep meaning to return to the poor, abandoned blog, and do have a few posts waiting to be written. I really just need to get better organized! Old book 1 has stopped doing the rounds now, so its chances of finding an English publisher for the moment are non-existent. Never mind, those lovely Germans seem to be buying it in reasonable quantities, which is nice. For now, I’m trying to get book 2 into a shape my agent is happy with – not an easy task, sadly. Book 3, which I was very much enjoying working on, is on the back burner for the time being until that’s out of the way. And I’m doing some freelance work editing other people’s blog posts, doing a bit of ghostwriting. The money is absolutely terrible, but it’s fun – and being paid at all for anything that’s fun has to be pretty good. And of course it helps to put off the point at which I have to give up and find a proper job! Ugh, finding a proper job – so old school! Wait – I need to do the same thing. I’m at the point where I’ve nearly accepted that no agent is going to give serious attention to me for a number of reasons, many of which have only cursory application to whether or not I can write. (My mom says I can write – of course, she sadly has advanced Alzheimer’s, and even when she was well, never read a word I wrote, but still, Mom says I can write.) Next logical step is self-pubbing but that needs a hearty BREAD basket, as in money up front but mine is currently behind. So – I’m still writing but agree my prospects are limited. As for your work – I’m still wanting to get to read your books one day, so hoping you find that agent! Best wishes to you as you ready your books. As for the blog recharging – sign me up right now. Mrs. Holder knew nothing. Tough choosing a favourite R book. I haven’t read ‘The River Midnight’. ‘Roots’ and ‘Ragtime’ are definitely among my favourites. I could have picked any one of the books on the list at the bottom (loved them all) but chose The River Midnight because it isn’t as well known. Figured I’d alert readers to a book they might not be familiar with. I have discovered a fondness for stories about the latter half of the 19th century. I put this one on my wish list at Amazon. Glynis, I think you really will enjoy this book. Please let me know if you read it, what you think about it. As a teen The Red Badge of Courage and The Red Pony were too sad but I loved them. Thanks, Adrienne. I did a lot of crying through books. At one time I read several of Alcott’s books and now I see I have to look into the rest, at least Rose in Bloom. Her family had a unique lifestyle, her father being stridently devoted to his principles, but Louisa was the better writer. Something tells me you know lots about the Alcotts. This does sound wonderful, Shari. A slice of life I never would experience otherwise, meaningful, significant to those who lived it, worthwhile. Thanks. It was recommended by a another friend or I would never have run across it either. Perhaps because Nattel is a Canadian writer she isn’t well known here. I was not aware of this author and the book sounds intriguing. I wished I’d thought of that ending, once upon a time! It’s the kind of book that made me wish I’d thought of everything in it. It’s on my list, now. Thanks for the intro. I hope you enjoy the book. Please let me know. I’ve never read this, but it sounds wonderful. Nothing quite like historical fantasy–but I’ll take magical realism, too. Thank you for your suggestions – I’ll have to look up these titles. I didn’t know – my four grandchildren adore Thomas which is how all of them refer to the books. Everyone with a job to do and all of them interesting. Thanks for the info, Carson, about a childhood favorite. This is a book I have not heard of before either but thanks to your recommendation I have now put it on my list of TBR. Please let me know what you think of it should you read this book, Irene.